Mussels are a shellfish that contain omega-3 fatty acids and vitamin B-12. You can eat mussels raw, steamed, boiled or fried as an appetizer or entrée. No matter how you prepare them, you should always start with fresh mussels. Mussels that do not open during cooking or that have chips or cracks on the shell may be dead. 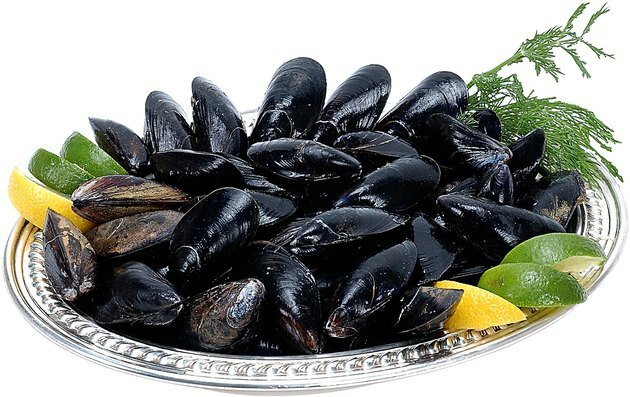 The meat of dead mussels deteriorates, increasing your risk of microorganism contamination, food poisoning, infectious disease and other health problems. Mussels that were harvested from contaminated water sources carry an increased risk of infection and chemical poisoning. Research by scientists at the U.S. Fish and Wildlife Service in Raleigh, North Carolina, published in "Environment, Toxicology and Chemistry" in October 2007 shows that contaminated waters containing high levels of copper, chlorine and ammonia were found in three drainages that affect freshwater mussels in North Carolina. The levels of contamination vary by drainage and location. Knowing the source of mussels prior to your purchase can reduce your risk of any potential health problems. Consuming mussels contaminated with heavy metals, such as mercury, cadmium or lead, can increase the risk of neurological damage and birth defects. Research by scientists at the Instituto Espanol de Oceanografia in Murcia, Spain, published in the "Journal of Environmental Monitoring" in May 2011 found significant differences in heavy metal concentration in mussels along coastal waters in the Western Mediterranean Sea. The scientists report that the run-off of water containing land minerals and chemicals from industrial activities impacts the heavy metal concentrations in the waters. Mussels can contain adenoviruses and increase your risk of infection. Adenoviruses cause gastrointestinal, bladder and respiratory infections that may result in diarrhea, rash and pneumonia. Research by scientists at the The Royal Swedish Academy of Sciences in Fiskebackskil, Sweden, published in the "International Journal of Food Microbiology" in February 2007 discovered high rates of blue mussels contaminated with adenovirus. The scientists conclude the highly variable rate and sporadic occurrence of accumulated viruses is a significant factor affecting food safety. Cryptosporidium parvum oocysts are parasites that infect the gastrointestinal tract. Research by scientists at the University of Complutense in Madrid, Spain, published in "Applied and Environmental Microbiology" in May 2000 discovered infective Cryptosporidium parvum oocysts in mussels from a shellfish-producing region in the Atlantic Ocean by northwest Spain. The scientists conclude that mussels act as a reservoir of Cryptosporidium parvum oocysts infection for humans. Becoming infected with these parasites can require long-term treatment.